We’ve found five key factors in creating buildings that achieve full occupancy, fast — optimized living spaces, cutting-edge amenities, aspirational design, fair market pricing, and superior customer service. In-Site Interior Design excels at reading the nuances of a given market to help architects and developers deliver on these imperatives. Of those five, as the team’s interior designer, we are responsible for the first three. To ensure good layouts, we review the architect’s base plans and make recommendations for better spatial flow in the units. 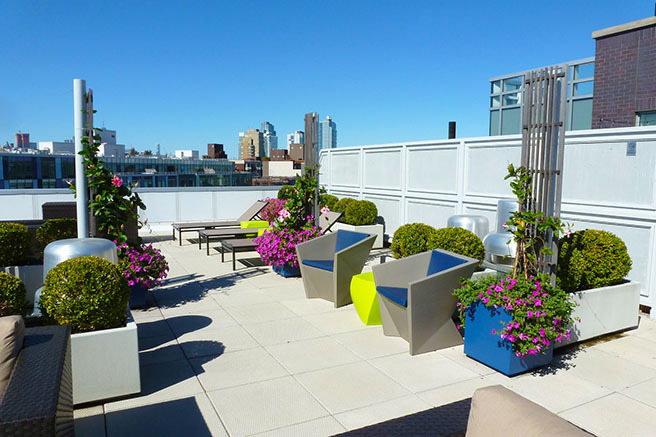 Then we create amenity spaces that give tenants and guests those extra spaces to relax in and enjoy. Some basic amenities include combining a pool table with a ping pong topper offering two games in one area and tables or counters with charging modules. A fitness center built on a good estimate of projected usage is key while a separate room for screening movies or gaming can be provided or even rented for parties, thereby becoming an income stream for the building. Other more unusual amenities we’ve considered recently are dog park rooms for those cold winter days and running free (while contained), recreation rooms outfitted with classic arcade games, libraries with rare books, storage rooms located on individual floors, and green rooftop terraces with bbq’s and showers. And don’t forget the in-house high-speed internet access that everyone expects, especially in business centers geared towards the entrepreneur or freelancer working from home. Meeting aspiration goals is key. 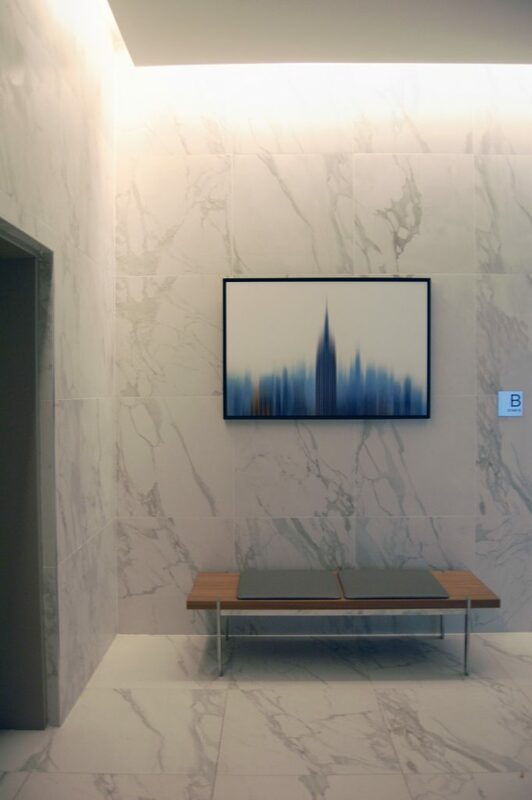 Today’s developments can look like luxury hotels with high end materials and custom lighting. We pride ourselves on designing buildings that go above expectations, but do so with well priced materials with long wearing warranties. Feeling good when you walk in and having that quality last is the ultimate goal after full occupancy is achieved. We know what it takes, and we’ll deliver for you. We all know that LED lights are replacing traditional ‘lamps’ (the official word for a light bulb) because they are more energy efficient. But do they do what we need them to do for us? Yes, LED lamps are excellent in regards to the electrical wattage being used. The comparison in wattage is amazing: a 100 watt incandescent translates to a 12 watt LED lamp. So we save lots of dollars over the course of the year in electrical usage. But being picky about the color of the lamp is really important. Manufacturers have come up with a 2700k (the k is for the Kelvin scale of color temperature) that tries to replicate the traditional “yellow-ness” of a typical incandescent lamp. And that’s what you will get when you just pick up lamps in any hardware store. But be wary: those 2700k lamps over time get too yellow! I think the way LED lamps are made is pretty cool. In a very simple version, lots of those tiny diode lights (those are the little dots of lights) are produced in wide and very long sheets or rolls. The ones in the center of those sheets are right on target with the color they are produced in, say 2700k versus 3500k. But those diodes on the sides and the very edges of the sheets aren’t so accurate. There are a lot of imported lamps that are inexpensive because they come from the edges of the sheets. They may start out close to 2700k but over time they will shift and get warmer or yellow as they go on. My recommendation is to go for 3000k whenever possible from a quality manufacturer (Target sells a GE lamp that is 2950k that is still warm but doesn’t scream Yellow.) Generally I specifiy 3000k in most interiors. It is crisp and clean without being too yellow (warm) or too cold (blue.) Homes, offices, rehabilitation centers all benefit from that clean color. Now, let me say this about lumens. Look for as high a lumen number as you can get. Lumens are really the brightness of the lamp. The higher the lumen, the brighter the lamp will be. And if you have dimmer switches, then you’ll be able to make your space quieter or brighter depending on what your mood is. Lastly, be aware: when you’re replacing a standard lamp with an LED lamp, if it is a fully enclosed fixture, you must get LED lamps that say For Fully Enclosed Fixtures. This is because if it’s not, the driver (the electrical part that feeds the light) will burn out. I had a terrible time on a project because the lamps were burning out in 3 months. We would all expect our new LED lamps to last longer than 3 months. We’re used to getting years out of fluorescents, so why shouldn’t we expect that? Well, the LED technology is fussier than fluorescent lights, and let’s face it, it’s still a relatively new technology that is being mass produced and they’re working on getting it right. So if that’s not enough, don’t forget about those wonderful Edison lights you are seeing all over. They replicate the early century of Thomas Edison lamps that have the filament of an incandescent glow. They have wonderful atmosphere and the very yellow light they give off are part of their charm! I’m including the chart below for your reference and I welcome any questions you may have. I will be talking about the future of lighting types and shapes in upcoming blogs so come back to check in. In the meantime, Shine Brightly!! This year’s Show was fun, especially the Dining By Design section. If you’ve been following me on Instagram you already saw some great room vignettes designed and built for the DIFFA Foundation. I invite you to take a look, but here’s my favorite. 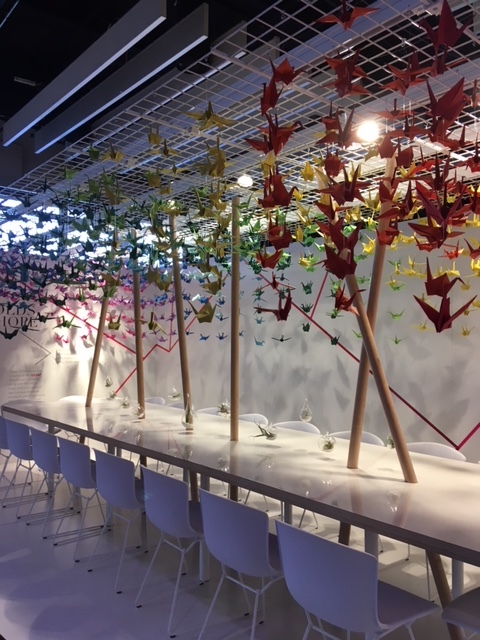 Designed by Gensler with contributions by Knoll and Evanson Best, the room featured thousands of origami swans representing the lives AIDS has touched. Italian high end manufacturer ILVE is featuring some great new colors on their line of ranges. 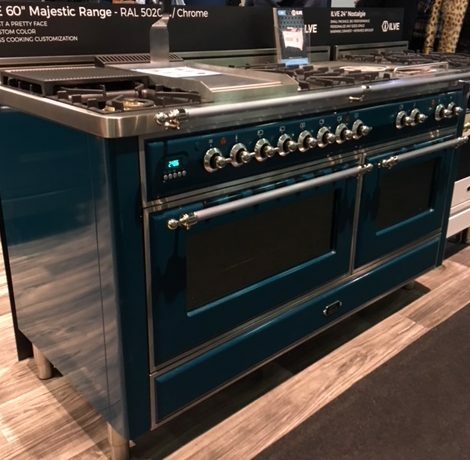 This 60″ model is every chef’s dream! Handmade rope panels or benches with custom patterns make great accent pieces or wall art. 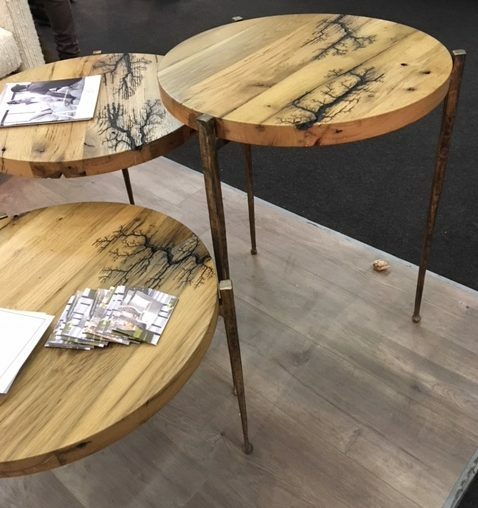 These wood tables use an acid wash to highlight fissures in the wood. The patterns resemble branches in a most beautiful way. At In-Site, we are always finding great new products. We attend 3-4 shows a year, take Continuing Education courses, maintain our LEED certification through research and start trends in design on our own projects. 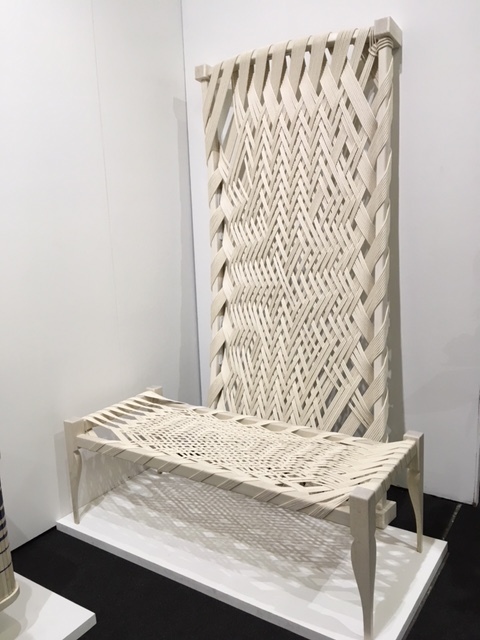 Check back in May after the International Furniture Fair to see what’s new then! We derive new ideas from so many different sources: newly constructed projects we visit, our favorite magazines (Interior Design, Architectural Record, Luxe, Interior Sources), websites (Pinterest, Instagram and Houzz) and Museums (The Met, The Whitney, MOMA.) It’s a never-ending feast for eyes that really look at the details. Whenever I enter a new space, I’m looking up to see what’s new on the ceiling and down to see what’s good on the floor. I touch, I feel, I experience. So often, a small detail I am inspired by, ends up as a larger design concept within a room I am designing. I challenge you to go on an expedition and find a room you are impressed by. Take note of just one detail and email me a photo, telling me what you love about it. I will give you an idea of how it could possibly be used in your next project! 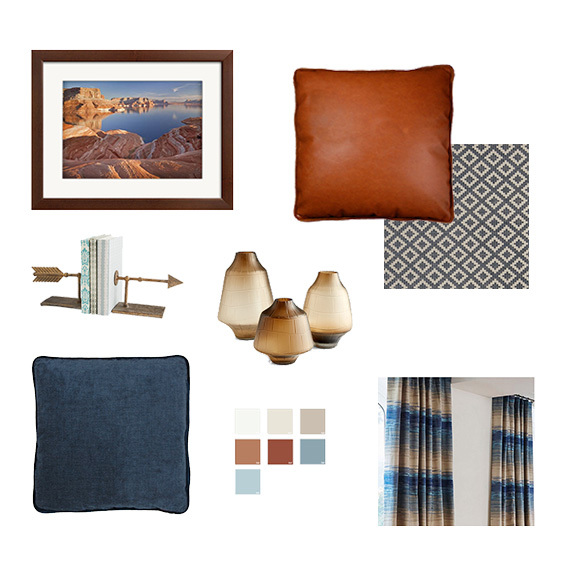 Check out our Home Collection for the Designer Packages that group objects, art, paint and accessories together to help give you instant (or almost) gratification to change a room, make a statement, and enjoy your surroundings. Bold Colors to continue. Some new directions will be Amber and Purple pairings. Diminishing of brass as a major accent where clean and contemporary spaces need to be clean and contemporary! Comfort becomes more important than looks. Those contemporary low back sofas will be overtaken by higher back sofas that you can rest your head on. Peace and Happy Designs to you throughout the Year! 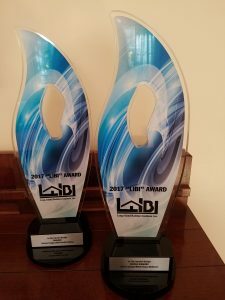 We’re so excited that LIBI, The Long Island Builders Institute, acknowledged our design excellence when it awarded us a Double Diamond, the top honor, in the Whole House Makeover for the Roslyn Heights project. They also awarded us the Diamond honor in the Multi Family category for the Skillman Suites project. LIBI is a strong association of Builders and Associates developing buildings across the metropolitan and Long Island areas and we are so pleased to have received this recognition from them. Both projects were the culmination of many months of hard work, drawings, specifications, and construction angst, that when I am in the finished spaces, I breathe deeply. Not only from a sigh of relief, but of excitement at having “birthed” a wonderful, fully-grown child! Because we put all of our heart and soul into our craft, each space/room/building is a creation of art and imagination. We are ever grateful to our clients, who allow us artistic freedom and give us the canvas to work on. I truly value the relationships that we have developed during the months of working together. I respect and I admire the people I serve. I keep their goals at the forefront of my mind and I thank them for their trust. Congratulations to them! Completing a project is like birthing a baby! Yes…I know, it sounds wierd. But the experience of designing a room and seeing it reach completion after the final accessories are in is similar to the joy and exhilaration of giving birth! Having birthed two beautiful babies, I know firsthand how wonderful and exciting it is. The wonder. The thrill of seeing them at last. The pride. We recently completed a project that took over 1 1/2 years to complete from design through furniture deliveries, past construction delays. But at long last and after a hard labor, I am proud to say we’ve given birth to an amazing….4 bedrooms, a study and a hall! I’m still so excited about the overall serenity of the Master Bedroom, the opulence and rich textures in the Guest Room and the fun color of the daughter’s room. 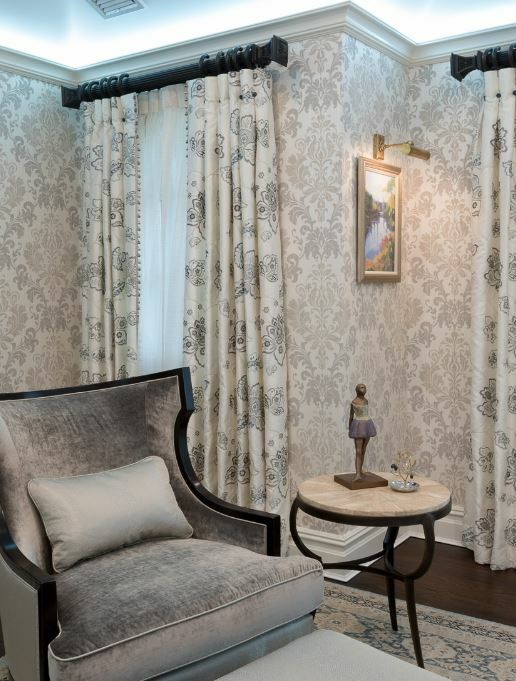 I love seeing the small details we packed in, like the blue velvet buttons on the Master Bedroom draperies and the backlit plexi custom cabinet which features the daughter’s snow globe collection. I love the wool rugs we found which fit perfectly into each room, and I love the bathrooms which are beautifully elegant with water-jet cut stone. Here’s a sneak peek of one corner in the Master Bedroom. We had the project photographed just before the client’s eldest daughter gave birth to a girl. We’re very excited for the family, and we’re especially happy that her former bedroom (now a special “Guest Room”) will be wholly enjoyed by the new family! Check back in two weeks when we’ll be able to post all of the project photos! In the meantime, Happy Decorating! Tips for Making a Room Sing! 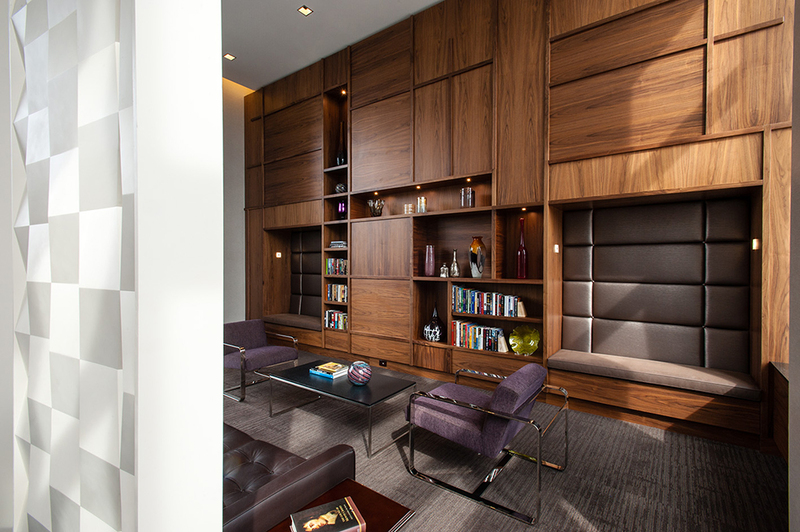 Our goal at In-Site is to create spaces that resonate with the personality of our clients. So we spend time learning about they like and what makes them happy. In order to help more of you have homes that you love, we’ve created six Color Schemes with Personality! When choosing a Scheme, look for the colors that make you happy! That’s the basis for any great design. Do navy blues make you feel warm and cozy? Then check out Classic Revolution. Do soft whites make you relaxed? Then you’ll love Winter Blush. Do you want to be energized? Go with Bold Play. Are you an urban chic? You’ll feel great with Urban Loft. Do you love vintage? Country looks? Then Farmhouse Retreat is for you. Does the Midwest inspire you? Do you love dusky blues and leathery browns? Feel the Santa Fe Valley! If you’re selecting paint colors for the walls, remember to look at the color samples vertically. Tape them to the wall. Look at them in morning light. And evening light. The paint colors within our Collections are all coordinated for you, so you know they work together great! It’s been a year in the making and our Luxury Home Collection is just about ready to launch. I’m so proud of what we created and how hard our team has worked to make it happen. The process has been fabulous and trying. With all the design projects still on our boards, we’ve managed to pull this together and we’re eager to bring it to the world! It is so important for us to be able to help people to bring a fresh look to their spaces. Have their spaces be nurturing, peaceful. All without a major overhaul of furniture (which gets really expensive.) Our Home Collection is the easiest way to get a new look. Changing the paint color of the walls can either be a weekend project for those DIY-ers like me, or you can hire a painter when you’re ready for a professional job. Our Collection will helps by bringing you all these items together in one place: draperies, pillows, art and new accessories. All beautifully coordinated. All without spending hours of shopping stores and websites. This is very exciting! We can’t wait to start seeing photos of the transformation of the rooms you want to change. We wholeheartedly invite you to send us your BEFORE and AFTER photos to show us how great the room looks! Any room can be transformed: Living Rooms with new window treatments: Look for the cool top treatments we have, like grommets or tab tops. There are such great fabrics and colors. ‘Throw’ in a few great throw pillows and add a coordinating tall vase for drama! Bedrooms: Add new art, throw pillows on the bed (with neutral bedding that you already own!) and Viola! It’s a whole new look! Dining Rooms: Choose a new drapery for the season with a stylish drapery rod and some great art for the walls. Put a new sculpture on your credenza. Boom! It’s Awesome! Any room can be uplifted, enlivened, and made dramatic! And if you need help selecting just the right look for your room, you can enlist one of our designers to provide just the right design assistance. Book a consultation: 1 hour or 3 hour packages are available. 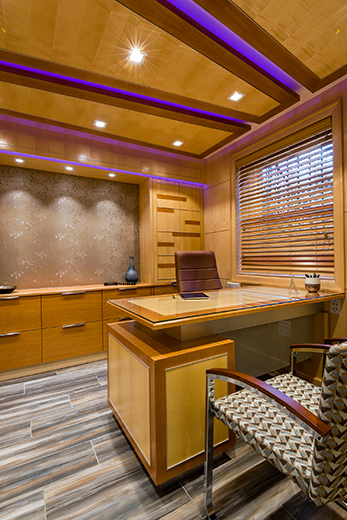 And if you’re redoing the whole room, call us for a proposal to fully customize your home or office. We’ll help you define your style, and bring your space to life! And we’d love to meet you!